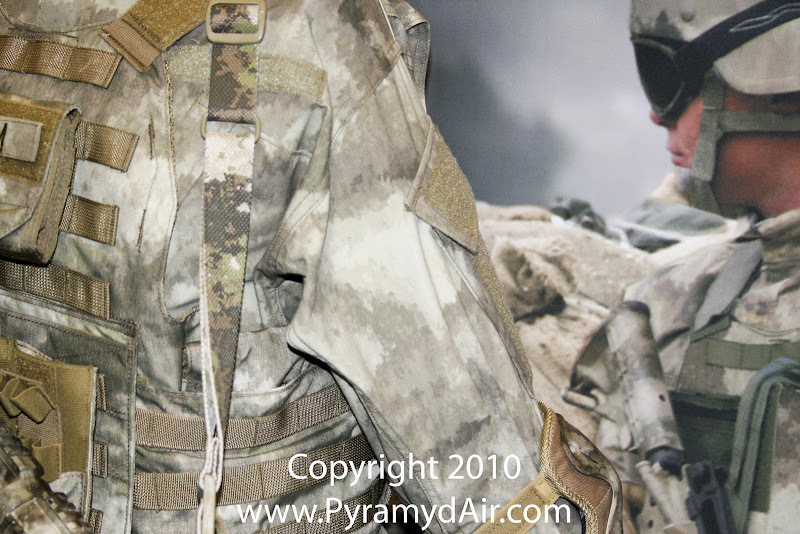 Pyramyd Airsoft Blog: Shot Show 2011 - New A-TACS Camo Pattern: The New Gucci-Cam? 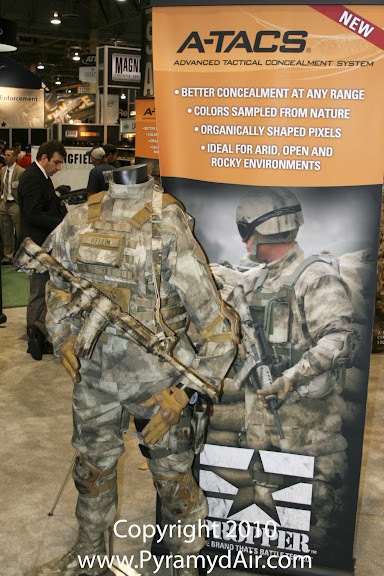 Shot Show 2011 - New A-TACS Camo Pattern: The New Gucci-Cam? So I was running out of time on my last day at the amazing and oh-so-incredible Shot Show 2011, but I thought I had better stop by the Propper Booth to get the scoop on their new ACUs & Combat Shirt all covered in the new and VERY intriguing, Advanced Tactical Concealment System (A-TACS) Camouflage Pattern. I talked with Joe Ruggeri, who is Propper's Product Manager and, I was told by others, helped in the design of these new unis. Basically, Propper has two sets of tactical clothing coming out that each utilize this highly innovative new camouflage design. The set slated for release in just a month or two, is the Propper A-TACS Army Combat Uniform (ACU). They are sewn to military specification and have a composition of 65% polyester and 35% cotton ripstop for extreme durability. Even though these are technically designed for military purposes, they make a great option for the serious Airsoft player who runs his gear through the Airsoft gauntlet every weekend. The second tactical clothing option Propper will be releasing in the late summertime is their A-TACS TAC.U COMBAT SHIRT. This shirt is similar in style to the 5.11 Rapid Assault Shirt that I reviewed a little while ago here on the Pyramyd Airsoft Blog. The Sleeves are 50% nylon and 50% cotton ripstop, while the Torso is 60% cotton and 40% polyester for added breathability when worn underneath all that heavy body armor. Near Infrared (NIR) Signature Management Technology is used by the U.S. Department of Defense to prevent detection by NIR Image Converters. These photocathode devices do not detect temperatures, but rather infrared radiation variances. 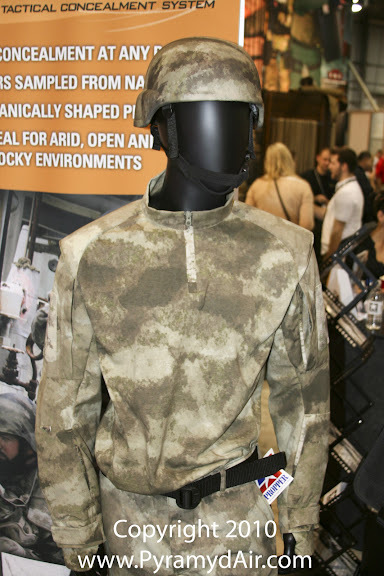 NIR-compliant uniforms use a special fabric that allows soldiers to appear at the same radiation level as the surrounding terrain, thus making them more difficult to detect. NIR technology also make uniforms less visible in low-light environments by reducing the reflection of light." The A-TACS camo design can and will be used on pretty much everything in your loadout, including your gun. There are already a few manufacturers out there right now who are offering parts or entire Airsoft rifles with the A-TACS pattern. A few of the things that make the A-TACS pattern so innovative include the way they have replaced the digital, square pixels we're used to seeing on several U.S. military tactical uniforms with small, organically shaped pixels. They have also made sure to remove all 90-degree angles to create a more fluid, natural appearance. The colors of the A-TACS pattern are digitally-sampled from real-world elements for enhanced concealment. The pattern design is supposed to be able to effectively break up the human outline at a greater range of distances, but the only way I'll know for sure is if I can procure myself a set and test it out!!! Since that may be at least a couple months, how about in the meantime we take a look at some more Shot Show 2011 material? I've still got news on the G&G Armament Booth, Pantac Tactical Gear, the real steel KRISS/SPHINX/DEFIANCE booth, to name a few. Speaking of KRISS and A-TACS, here is the KRISS Carbine coated in A-TACS Camo. 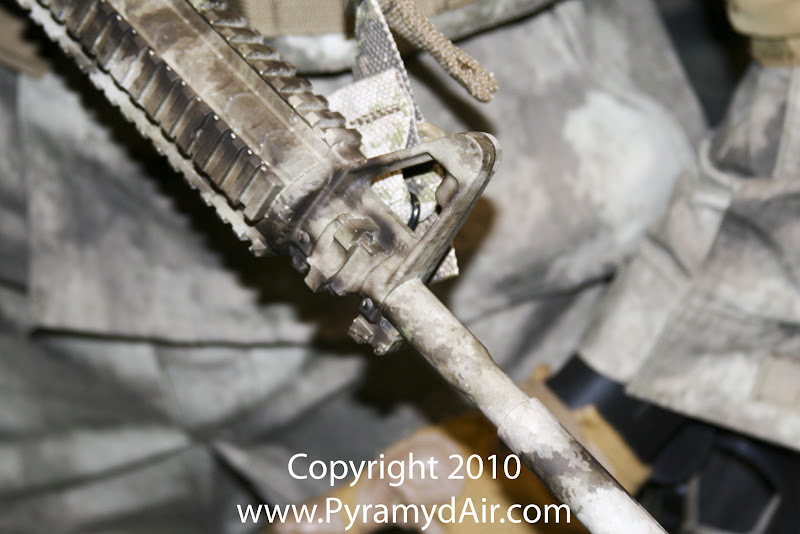 So keep checking in to the Pyramyd Airsoft Blog to get your fix of Shot Show 2011 news!